Projects are a new way to manage your flow files. Rather than treat your flows as a simple pair of files, they represent everything you need to create a redistributable Node-RED application. They are backed by a Git repository, meaning all of the files are fully version controlled and allow developers to use familiar workflows to collaborate with others. In the 0.18 release, the projects feature is in preview mode. That means it must be enabled in the settings file. The feature is not currently available in the IBM Cloud environment. To enable the projects feature, edit your settings.js file and add the following option within the module.exports block and restart Node-RED. The feature relies on having the git and ssh-keygen command line tools available. Node-RED will check for them on start-up and let you know if they are missing. When you open the editor you’ll be greeted by a welcome screen that invites you to create your first project using your existing flow files. 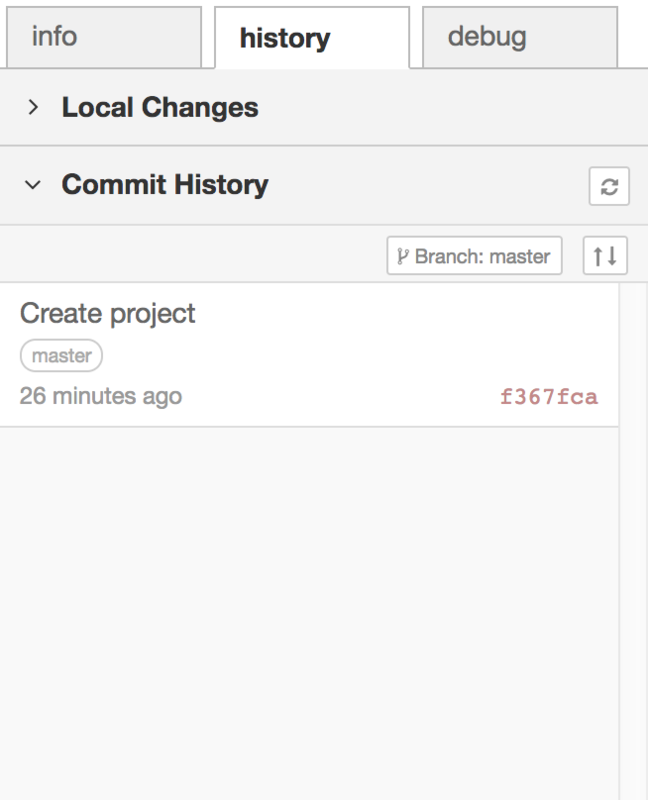 Node-RED uses the open source tool Git for version control. It tracks changes to your project files and lets you push them to remote repositories. When you commit a set of changes, Git records who made the changes with a username and email address. The Username can be anything you want - it does not need to be your real name. 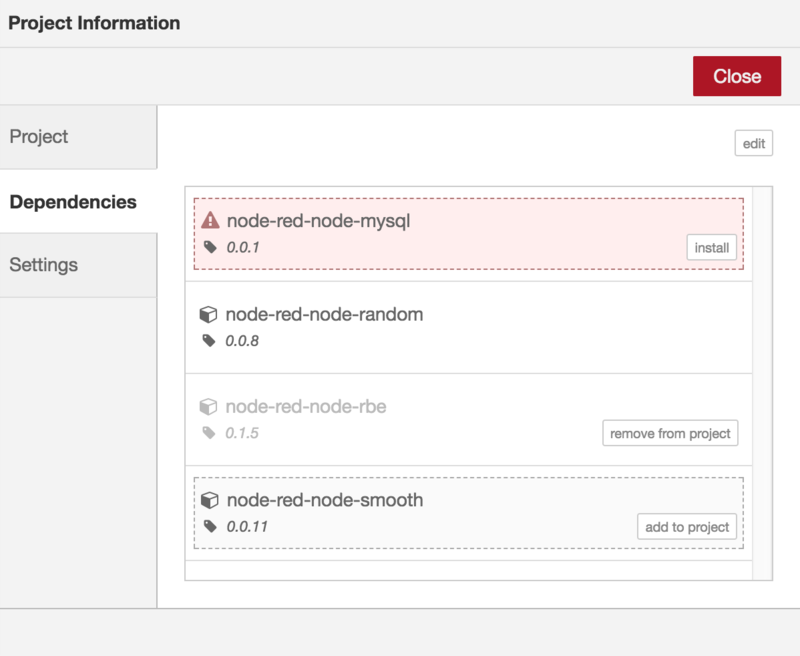 You may already have your Git client configured - in which Node-RED will reuse those settings. You can change these settings at any time via the main Node-RED settings dialog. The next step lets you name your project and given it a description. Node-RED will automatically migrate your existing flow files into your project. You can choose to rename them here if you want. As you may choose to share your project on public sites such as GitHub, it is strongly recommended that you encrypt your credentials file. To encrypt it, you need to choose a key that will be used to secure the file. This key is not stored within the project. If someone else clones your project, you will need to provide them the key to decrypt the credentials file. Otherwise they will need to edit the flow to provide their own credentials. The project is then created in the directory: ~/.node-red/projects/<project-name>. Once you have created your project, you can continue to use the Node-RED editor just as you always have. There are some new parts of the editor that have been added to work with your project. The Info sidebar now shows what project you are working on at the top. Next to the project name is a button that opens up the Project Settings dialog. You can also access this from the Projects -> Project Settings option in the main menu. Project - lets you edit the project’s README.md file. Each project has its own package.json file that includes a list of node modules the project depends on. The Node-RED editor tracks what nodes you are using in a flow and helps you to keep that list of dependencies up to date. Finally node-red-node-smooth provides a node that is used by the current flow, but that module is not listed as a dependency. Keeping the dependency list up to date is important if you want to share the project with others - as it will help users to install the necessary modules. The project settings tab lets you manage your flow files, the encryption configuration of your credentials and configure your local git branches and remote repositories. 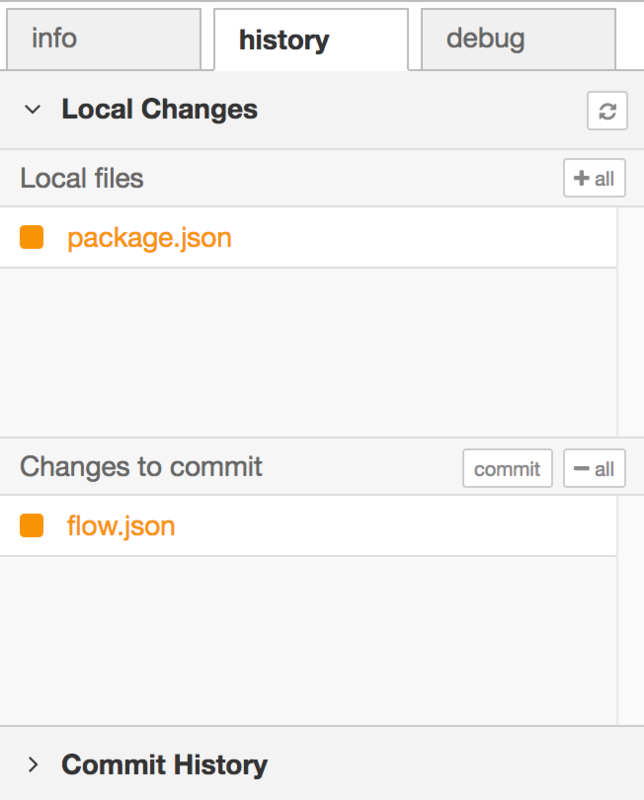 Local Changes - shows project files that have changed, allowing you to stage and commit them. Commit History - a list of all commits in the repository, with tools to push commits to remote repositories. 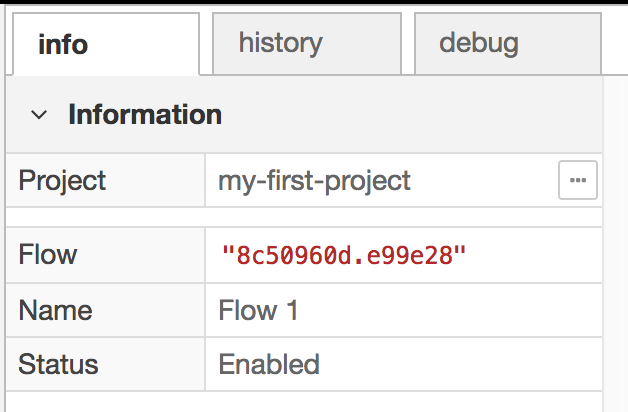 Whenever you change a project file, such as by deploying a new flow configuration, it will be listed in the ‘Local files’ section. You can click on the file name to see a diff of what has changed. When you hover over the file, you’ll see a + button - clicking that will stage the file - moving it down to the ‘Changes to commit’ list. When you have staged the files you want to commit, click the commit button, enter a message and confirm. The Commit History section lists all of the commits in the current branch of the repository. When you create a project, Node-RED automatically commits the initial set of default files for the project. At the top of the list is the ‘Branch’ button. That allows you to checkout/create branches within the repository. If your repository has a remote repository configured, there is also a button that shows how many commits ahead and/or behind your local repository is compared with the remote. It allows you to pick the remote/branch to track, and push/pull your changes to the remote. This is one area that the Node-RED editor tries to simplify the user experience, and doesn’t expose all of the various options git provides. This is an area we welcome feedback on. For example, it does not provide options to rebase your local commits, or force push your changes to the remote. You can still do those things by falling back to the command line. After you have created your first project by migrating your existing flow files you can create additional projects. Selecting Projects -> New from the menu opens the Projects dialog. Node-RED only runs one project at any time. By opening another project you change what flows are running. The ‘open project’ view also allows you to delete projects by hovering over them in the list and clicking the delete button. You cannot delete the active project. This lets you create a new project. It provides the same options as the ‘create your first project’ set of screens, but collapsed into one. This lets you clone an existing remote repository. You can use either an http(s) or git/ssh url for the repository. If the repository requires authentication you must provide it here. Note: for http urls, do not include your username and/or password in the url itself. You can should provide those separately when prompted. Node-RED does not currently make use of any credential helper you git client may be configured with. This is an area we look for feedback on from the community. For git/ssh, Node-RED will offer a list of available ssh public keys. This list is generated by scanning ~/.ssh for files ending .pub that have corresponding private key files. It also allows you to generate a new public/private key pairs via the ‘Git config’ tab of the main settings dialog. These files are stored under ~/.node-red/projects/.sshkeys/. If you have adminAuth enabled, the files are scoped to the current logged in user so they do not need to share credentials for the remote.